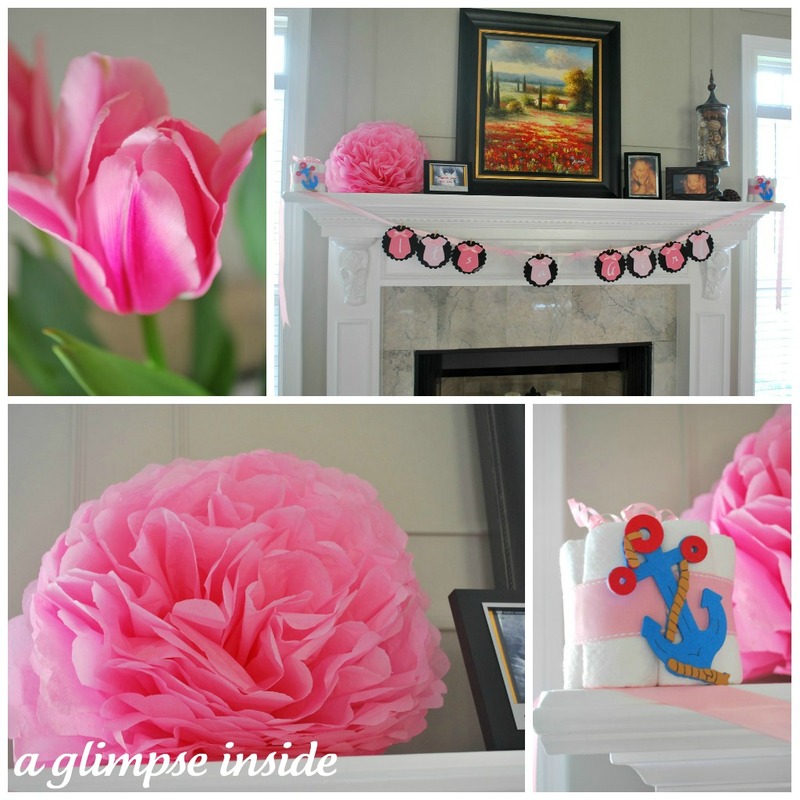 -Pretty Pink tulips were also on the porch getting everyone in the baby girl spirit. -The mantle was all decorated and ready for the party. -My mom made this large pom-pom flower that was perfect on the mantle. -And my sister ordered two small diaper cakes with anchors on them (my sorority symbol), and those were on each end. -For the party favors, my parents (yes, my dad helped out!) made these adorable jars of "White Trash" mix. Topped them with mini pom-poms and a ribbon and they fit right in. 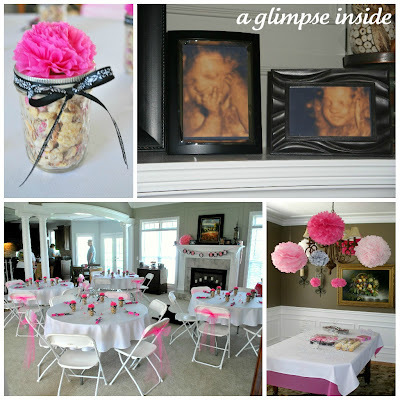 -3D ultrasound pics of Baby M were also on display on the mantle since the party is all for her anyways. -Here is a shot of the room from one corner. Wish I got a shot with the flowers on the tables. OOPS! -And over the food table, hung some fabulous pom-poms made by my parents. -My mother-in-law created all the adorable flower centerpieces. She made them look like an ice cream sundae. -Inside the flowers were little picks with an image of an ice cream sundae on one side, and a message on the other. -And then my mom made this fabulous tulle tu-tu skirt for the gift table. -My sister bought this "It's a Girl" banner from an etsy shop and it was hung along the mantle. -The water bottles were wrapped in this cute label showing off Baby M's name. -Candy bar also had to be in the pink, white, and black color scheme. -And then on a table they laid out small cards where guests wrote wishes to Baby M, addressed envelopes to help with my Thank You notes, and also had a notebook out where guests wrote words of advice to me. 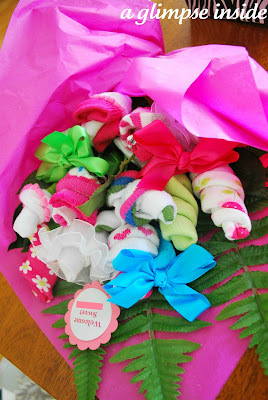 My mother-in-law also made this cute flower bouquet out of baby socks, hats, and hair bows! 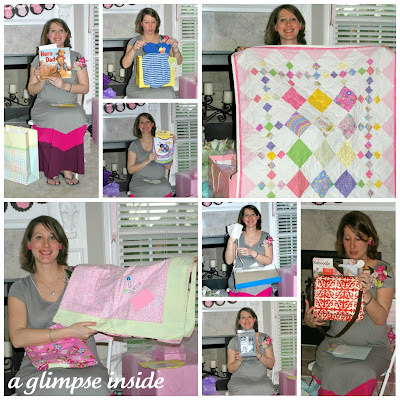 Baby M got a lot of fabulous goodies! -A couple blankets, one quilted by my best friend's mom, some more made by Travis' aunt, and she also got a pink crocheted blanket from my parent's neighbor. -Of course, adorable clothes were given. -And lots of other fun stuff! It was so fabulous seeing all my friends and family again! 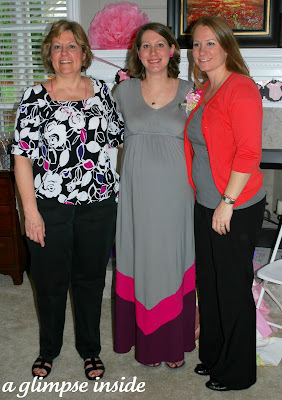 It was a fabulous shower celebrating Baby M and it got me even more excited for her arrival!! Special thanks to my mom and sister for all their hard work and to my mother-in-law for the gorgeous flower arrangements! Love you guys!! How special! 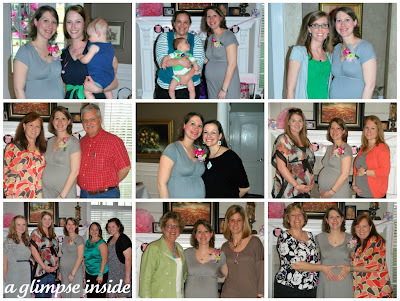 Celebrating a baby is such a tender time. There's just something that tugs on your heartstrings. Maybe that's the mawmaw coming out in me! First of all, I LOVE your dress!! SO cute & I bet it's pretty comfy, too! :) What a beautiful shower! The color scheme & decorations are beautiful! What a great shower! Did you play any games or do any activities? I'm looking for non-cheesy ideas for my sister in law's shower next month. Thank! And congrats on that bump! We only played one game. It was the game where everyone wears a cloths pin or safety pin and you pick one or more words that can NOT be said, such as baby or cute. If someone hears someone saying one of the words, they steal their pin. Object is to collect as many pins as possible and of course, not lose your pin. And then we were letting guests take home the centerpieces so I just searched baby trivia facts and whoever answered correctly first, won. Oh how fun is that. I love all the special touches that were put into your day. what a cute shower! Looks like you had a great time and it was so sweet for your family to throw you such a great party. I just started following your blog and I have to say that you certainly are a "crafty" family! What a beautiful shower your family threw for you, everything was so pretty and looks so professional! I love the bouquet your Mother in Law made as well. Congratulations on Baby M and thanks for sharing all the fun of your special day with us. Hearty felicitations on Baby Mother..and thank you for sharing this blog. 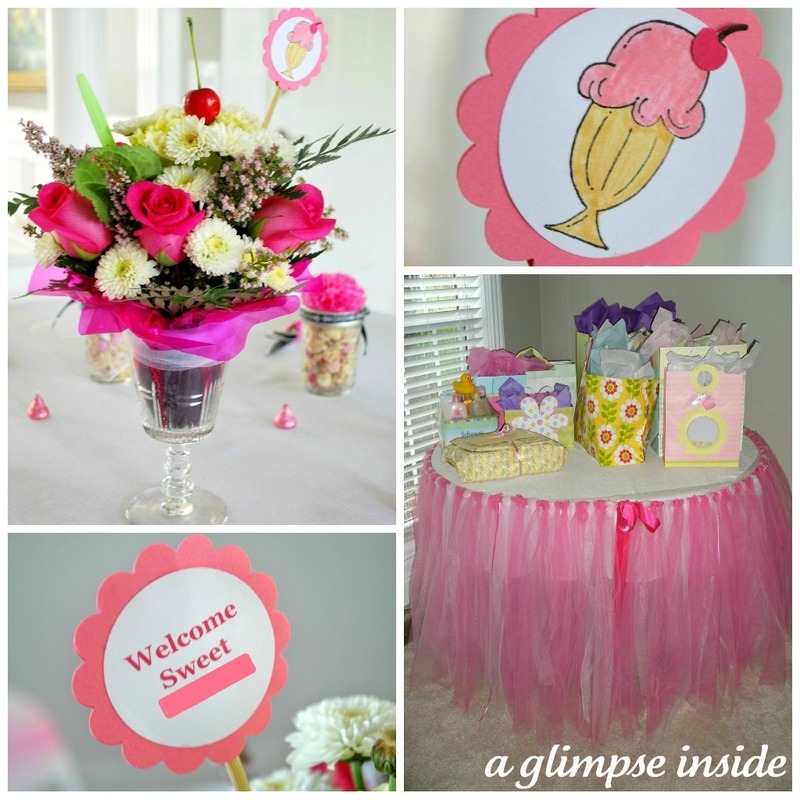 You said above that your mother-in-law created all the adorable flower centerpieces. I love it and I want to appreciate her work. 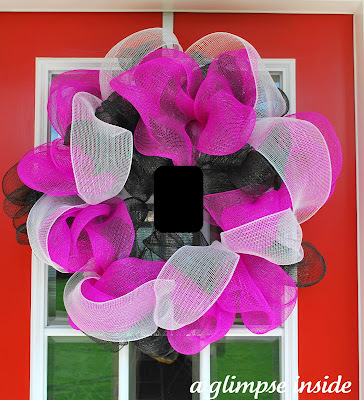 Keeping creating such cute cute crafty things and share it on blog. So that I'll also try to make it for any event. I usually make event banner and flags for parade.